I Can Fix Up My Home | Building a Headboard for the Master Bedroom | With a few tools and patience, you can create custom furniture that will last for generations. © 2011 by Jessica Ackerman All rights reserved; content may not be copied, rewritten, or republished without authors written permission. People who are really picky about their furniture or those who want to save money and beautify the home by doing the work themselves often choose to customize pieces such as the headboard in a bedroom to get the perfect look. For a unique look, you may wish to consider building a headboard for the master bedroom instead, which is a fun solution to creating the perfect addition to your space. It is not a hard project, and it can be a great way to ensure that your headboard coordinates with the theme, style, and shades in your master bedroom décor. Unless youre an accomplished woodworker and comfortable doing your own design and layout, its best to work from a project plan. 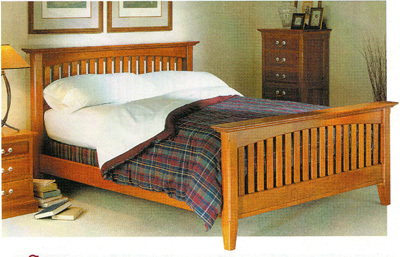 For example, the very comprehensive plan for the bed pictured above was purchased from Rockler.com and can easily be modified. But even if you are just getting your feet wet in woodworking, do not be intimidated. Its a fascinating and rewarding hobby and income generator. Joinery tools, depending of the method you choose, which might include a mortise and tenon jig, router, biscuit joiner, mallet and chisels, etc. A classic headboard should measure a few inches beyond the mattress on both sides and about a foot above the top of the mattress so that you can see it above your pillows. For a more contemporary look, a sleek, low profile headboard is best, with the same side measurements but a lower top by a few inches. The most sophisticated looks call for a high headboard, so increase the classic size by six inches to create a high, regal headboard for the master space. Regardless of style, you can build a headboard with posts that extend to the floor or a hanging one, like many hotels use. Sand the frame of your headboard to remove any roughness, using your hands to feel the surface and remove any lingering splinters. Wipe clean with a dust cloth and follow the manufacturers directions for applying the stain to the wood. You can use fabric, paint, stains, Danish oil, or other options to create your headboard; paint or stains are the best choice to get a traditional headboard look that coordinates with any décor. If youre building with an expensive hardwood like oak or cherry, an oil or polyurethane are good choices to show off the grain. For example, Minwax offers a line of polyurethane with stain built in if you want to alter the color of the grain a bit. Be sure to prime the wood if you are using a colored paint finish. Choose the color of the paint according to the rest of your décor, or introduce bold colors or striking contrasts on the headboard. This is the rooms main focal point, so it can be a lot of fun to create a unique piece of artwork as part of the bed. If you have some art experience or a few stencils, you can even draw something unique on the flat surface, creating something even more interesting for this space. This part can be tricky, since it requires accurate measurements and straight lines so that it is hung evenly and looks great. Use a drill to hang a wall-mount bracket that is strong enough to hold the headboard that you have chosen. Make sure that the frame is sturdy, especially if it is heavy, to avoid hurting someone if it falls. You can find brackets at any hardware store, and if you are unsure as to which is best ask a store associate to help you choose the right tool for the job. After your brackets are in place, hang the headboard above the bed and make sure that its centered. Any shape that is not flat on top needs special attention to ensure that it is in the right place, which is a good reason to pick a traditional square or rectangular shape for the headboard. Make any adjustments necessary, and then scoot the bed back into place in front of the headboard. With signature design style, Jessica Ackerman, an online writer with WallDecorandHomeAccents.com, describes bold approaches to southwestern wall sculptures and contemporary wall hangings. Website © 2011 Kelly Smith all rights reserved. Article © 2011 Jessica Ackerman All rights reserved; content may not be copied, rewritten, or republished without authors written permission.